The Haws 3202 Drinking Fountain is a barrier-free pedestal unit. 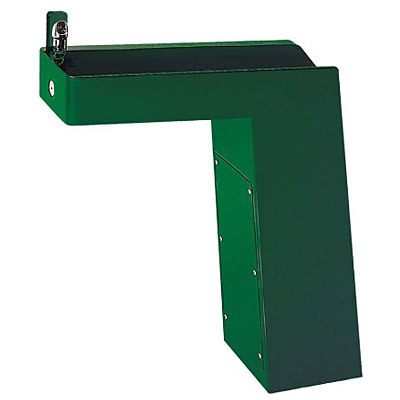 Shall include a 12 gauge galvanized substrate steel pedestal with green powder coating, push-button operated valve with front-accessible cartridge and flow adjustment, polished chrome-plated brass vandal-resistant bubbler head backed against a pedestal guard, trough design in the pedestal instead of a waste to eliminate clogging, a 1/4" spacer to raise the pedestal off the ground which reduces the potential for corrosion, integral mounting feet, and an over-size vandal-resistant access plate. Perfect for either public or private settings, the trough style fountain is a great fit in areas more prone to drain clogging. Completely eliminating the need for a traditional fountain drain, trough fountains are a nice complement to outdoor environments where a gravel fill can be implemented. Heavy-duty steel and green powder-coated finish make for a solid freestanding design that will hold up and blend in with the environment. More specifically, this fountain is applicable in forest/campground environments as well as parks, schools, and other outdoor areas where drinking facilities are needed. Heavy-duty 12 gauge galvanized steel with a green powder-coat finish incorporates a recessed push button and welded bubbler guard to provide extra durability, a large access panel for ease of service, and a vandal-resistant bottom plate for added peace of mind. Polished chrome-plated brass bubbler head is equipped with a shielded, anti-squirt orifice that provides a steady sanitary source of water. Unique design allows this pedestal fountain to be placed in the harshest of outdoor environments without the worry of a clogged drain. When water is activated, the excess flow runs from its trough basin off the back and onto the ground - perfect for beaches, play grounds, and other areas high in debris.